What better way to celebrate the arrival of fall than with some seasonally inspired face and body pampering? Pumpkins are brimming with Vitamin A, antioxidants, Vitamin C, and Zinc. This mask is great for all skin types and will give your face a healthy glow. Combine all of the ingredients and apply to a clean face in a circular motion, making sure to avoid the eye area. Leave the mask on for 15- 20 minutes, then gently rinse off with warm water and pat dry. 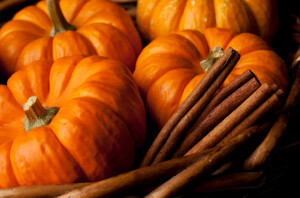 Spice up your pumpkin with brown sugar, a natural exfoliant! This scrub will leave your skin feeling smooth and refreshed, and smells heavenly! Combine the ingredients and apply all over your body (concentrate on areas where your skin is driest), avoiding the face and scrub gently to exfoliate. Rinse off scrub with warm water and pat dry. Cinnamon, while having antiseptic and exfoliative properties, can irritate sensitive skin. Test a small patch of skin first and be sure to avoid the eye area. The acid in cranberries acts as an exfoliant, and vitamins A and C help boost collagen production. Cranberries also fight free radicals that may cause wrinkles. For centuries, cranberries have been valued for their medicinal, antioxidant, and anti aging benefits. Because of their amazing capabilities to protect the skin, cranberries are also among the best treatments to protect your skin against harsh winter conditions. Honey has excellent antibacterial properties and yogurt can be used to even out skin tone, in addition to being packed with nutrients for your skin. Combine all of the ingredients, and apply to a clean face in circular motions, avoiding the eye area. Leave the mask on for 15 minutes, then rinse it off gently with warm water and pat dry. Want us to do the pampering for you? Try our Pumpkin Special Facial, available only through the end of October! For more seasonally appropriate treatments and pampering give us a call, or schedule your next appointment online today. Enjoy the season!